Government has a duty to inform Canadians about its programs, services, policies and decisions. Open and transparent communication from government to Canadians is vital and the proper dissemination of public notices assures that the public is informed about important changes that will impact their lives. Canadians have a right to be properly notified of actions and activities that will affect their daily lives. Public notices in newspapers preserve and protect this legal requirement. Providing access to the information pertaining to that notice. Advertising is one of many ways the Government ensures that individuals, families and businesses have the information they need to exercise their rights and responsibilities and to make decisions about their health, safety and security. Publishing public notices in newspapers is vital to the democratic process of a community. In most cases the newspaper is also the only printed record of history for a community. Once printed, it cannot be altered, erased or hidden. It is critical to keep public notices in the public record with newspapers. If not, the door is open to misuse of office, government corruption and less accountability. Making information accessible online does not mean the public has been informed. Online public notices can only be effective if the public knows where to look and is willing to take time out of their day to go searching for them. More than 8 out of 10 Canadians read their local newspaper, so when a public notice is published in printed newspapers the likelihood is far greater that it will get noticed by its target audience. 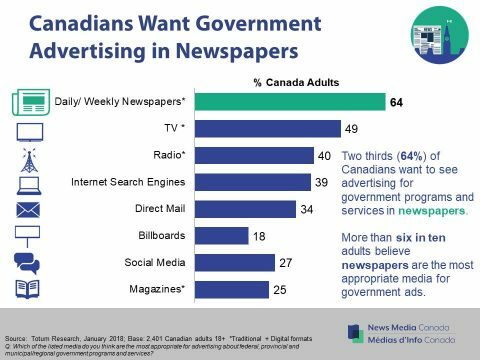 And two thirds of Canadians feel that the most appropriate medium for communicating government programs and services is newspapers.